Additionally, the need to plow more money into electric vehicle and autonomous vehicle development is driving the $13.6 billion, or 12 billion euros, plan to trim expenses. However, BMW officials admit it’s an aggressive response to only a potential problem. “Depending on how conditions develop, our guidance may be subject to additional risks; in particular, the risk of a no-deal Brexit and ongoing developments in international trade policy,” BMW Chief Financial Officer Nicolas Peter said during the presentation. Brexit looks to be the fly in the ointment at this point, although BMW officials say they expect an “orderly” Brexit, despite recent votes by British Parliament against Prime Minister Theresa May’s latest proposal as well as a move to hold another election to vote again on the withdrawal from the European Union. Officials noted that any disruptions from a disorderly Brexit would be likely to normalize after four to six weeks. The only plant the company has in Great Britain is the Mini facility in Oxford, England. If Brexit goes off the rails, BMW will simply move production to facilities on the continental Europe. This would be the plan too if possible tariffs become cost prohibitive. The plan to save more than $13 billion would do so by reducing the number engine and transmission combinations by 50% and using computer simulations to cut development times and the need for actual prototype vehicles. The company builds as many as 2,500 each year. The is going to look to cut the size of its workforce by making some changes at the plant level. 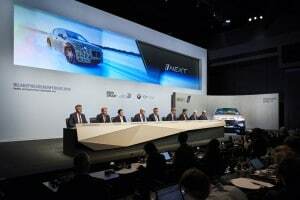 The company also plans to cut the number of management board members to seven members from eight by not filling the vacancy created by Peter Schwarzenbauer’s retirement. BMW said it expects the operating margin in its automotive division to fall to between 6% and 8% this year, which is below its 8% to 10% target. Last year’s automotive operating margin after special items, was 7.2%, making BMW the most profitable premium carmaker. One question that wasn’t answered during the presentation was the fate of Chief Executive Officer Harald Krueger, 53, who was expected to receive a contract extension. It’s is due to be discussed this year if the supervisory board agrees. Krueger was hired for a five-year term in May 2015 and it is customary for German companies to communicate a year before contract expiry whether a board member’s contract will be extended, according to Reuters. In addition to not meeting all of the company’s targets, Krueger’s health was called into question after he collapsed on stage during his first major press conference in 2015, which officials blamed on dizziness at the time. This entry was posted on Wednesday, March 20th, 2019 at and is filed under Asia Pacific, Automakers, Automobiles, BMW, Business, China, Earnings, Europe, Executives, Financials, Luxury Vehicles, Markets, NAFTA, Personalities, Sales, Sales, South America, U.S./North America. You can follow any responses to this entry through the RSS 2.0 feed. Both comments and pings are currently closed.